File Name: George A. Roberts of Everett, Massachusetts. Notes: Everett is a suburb just north of Boston, on the north side of the Mystic River. Barbecue, Blocker, and Col. Courage are from Boston itself. To my knowledge, Space Shot was never animated. Accessories: black pistol (90 Ambush's), white round space helmet with large chinguard (new), huge blue backpack with gold lever and grappling hook on black string (new). 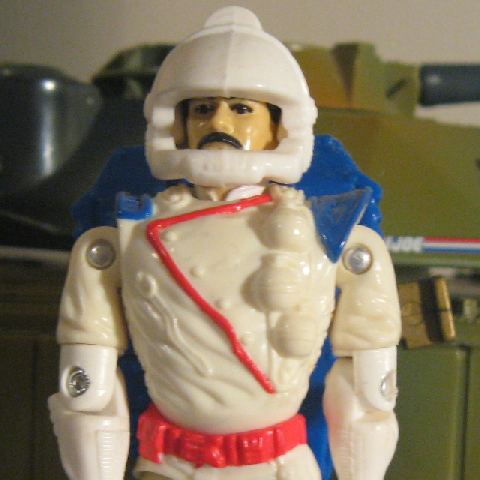 SPACE SHOT was known throughout the galaxy as a fly-by-night freighter pilot with a rebellious reputation. Blindfolded, he'd fly loads of cargo through the rings of Saturn for fun, the kind of fun most pilots would have nightmares about! DUKE knew he couldn't pass up recruiting such a skilled pilot, and after a few hard lessons in military discipline Space Shot became less of a rebel, and more of a hero. He has since defended four space stations from Cobra attacks, and he makes Cobra Blackstar pilots look like flight school trainees!